A Search for Health and More Good ThingsLast sunday in the Loire. What do you think can make so many people get up early on a sunday morning and walk 10, 12 or 18 kilometers accross woods, fields and vineyards ? Many villages of the Loire (and France) have found out how to gather in one day more people than the official count of inhabitants (450 for this particular village) for the sole (well, quite the sole...) purpose of doing some healthy exercise...Welcome to the "marche avec ravitaillement" (walk with buffets), a yearly ritual where you can treat yourself with good food and drink wine all the while exercising and visiting the hidden sides of backcountry villages. 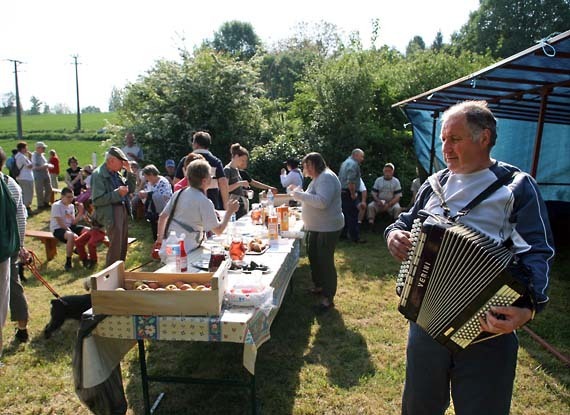 If you stay long enough in the Loire in spring and ask, for example to the nearest Mairie (city hall), there is a chance that you may find a village in the region where a "marche" is organized. Many rural communities, with the help of the local chapter of a non-profit health group named UFOLEP, organize once a year such nature walks. 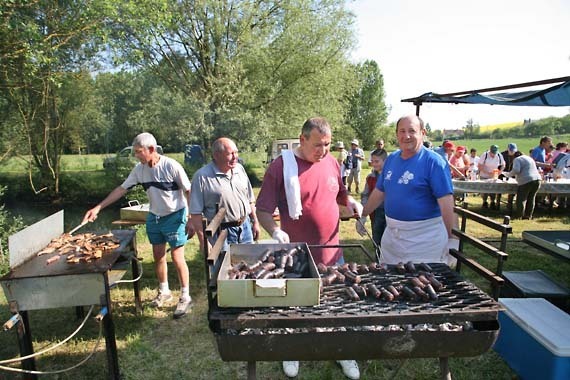 Here is as it goes : village employees and volunteers of the local "Comité des Fêtes" are in charge of all the details, marking of the itineraries, cutting the grass on the grass roads and preparing the food and drinks. It seems easy at the first glance but this is a lot of work and these people are doing a great job for their community. a Welcome Buffet in the NatureThe goal of these walks is both to promote the village and help the local businesses, and push people of all age to practice a healthy life style and appreciate nature walks. The itinerary is mostly grass roads and dirt roads, plus a few stretches of secondary paved roads. The starting point is usually somewhere in the village, a community building or the stadium facilities. I've done quite a number of these walks and here is how it unfolds : Most of the time, it's sunday. You drive, ride or walk to the starting point (it's been usually advertised by flyers the previous days) between 7:30am and 9am. You pay a 3,8 Euro fee for adults, take the itinerary sheet with your ticket and begin to walk quietly. You don't really need the plan, it's all marked with chalk on the ground and with color signs (typically : yellow : 10 km, blue : 12 km, red : 18 km). We usually choose the shortest walk (10 km), with the excuse that we are already familiar with walking in the woods, and because I want to spend time at the buffets (to socialize, of course...). 9:20am - Rosé with Fresh Goat Cheese : Every Day Should Start Like That...Now you begin to see the real engine of our sudden health consciousness : what's the point to sweat under the sun or endure (depending of the year) cold temperature and rain if you dont have these compensating buffets in the middle of the road...This picture shows the 2nd buffet, which was set up near an isolated farm. Things begin to be serious : rillettes, fresh goat cheese on soft bread, and rosé and red wine to enjoy the whole thing. I didn't mention it but there's no control on what you eat and drink, it is mostly make yourself at home. People drink and eat like they feel comfortable with and I didn't see some obvious excess. All the products are locally made, either by village farmers or by a local/regional company. My only critic for this last village hike was that the rosé seemed a bit sweet, I'd have liked a drier wine. The red came from a local winery that I know, but with the sun and rising temperatures, I found wiser to opt for the rosé. The rillettes were excellent, fresh and tasty. Food and Drink for the EarsI didn't make this up, there is always an accordionist at the third buffet in this particular village hike. His name is Michel and he helps like the other volunteers. 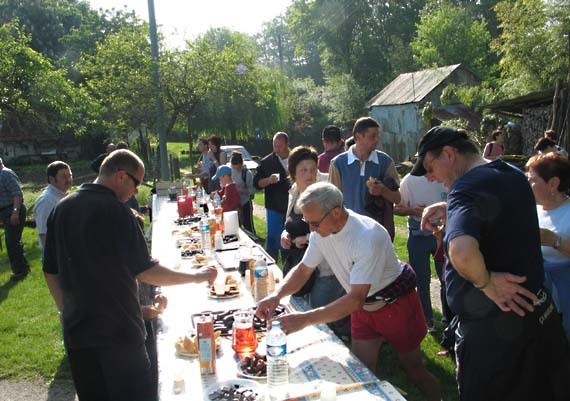 The 3rd buffet is the best one : the wine choice is the same, with the rosé and the red, apples for the diet-conscious, but the rest of the food is grilled meat, merguez and, last but not least, blood saussage (boudin noir). You really need to start the walk no later than 8am if you want to enjoy this buffet and chat with the people you know. This is a garden party with an age range between, say, 4 and 80. Btw, where do these people come from ? Mostly from the surrounding villages (including a few brits who settled in the region, like the guy in black on the left in the 3rd pic above), plus a few parisians who spend the weekends here. Because of the flyers left on the windshields with informations about the next walks in the vicinity, people often make a walk every weekend in this season when they live in the region.... the Open-Air Kitchen BackstageYou have recognized the master of blood sausage, Gérard (on the right, blue Tshirt), who not only has prepared once again the coveted brown things, but volunteers along with a few other villagers to grill them and serve them to the crowd of walkers. We chat a few seconds and he wonders if the 60 kilograms of sausage will suffice. He prepared the sausage yesterday and it is as fresh as you can dream. Blame it on the tiredness and exhaustion after a (well...) long hike, I shamelessly ate three pieces of blood saussage and kept with the same rosé. The sun hits hard now and the shadow is rare at this buffet, maybe it's time to follow the yellow arrows again. Un Dernier Pour la Route..."Un dernier pour la route would translate into "a last one before hitting the road", which something that you can hear in French cafés or bars sometimes. 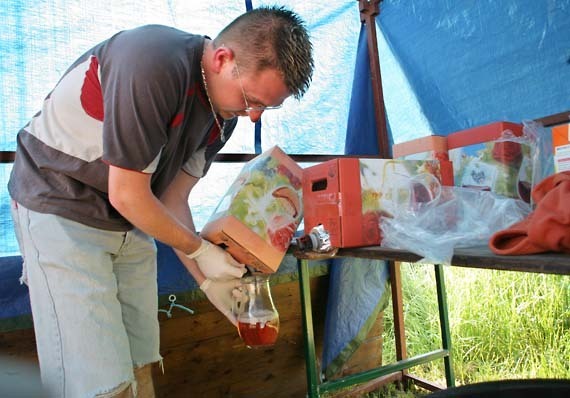 A volunteer fills a jug before bringing it to the table. There is enough fuel to move an army here. I understand the rosé/red dilemn : when the wheather is fine and sunny, people will overwhelmingly choose rosé, while if it's rainy and cold (which it can be at this time of the year) people will opt for the red. I think white wine from the Loire would be appropriate, a Sauvignon from Touraine would have been a better fit than the rosé. I'll dare a suggestion to the organizers, that I know well in this particular village. a Happy BritIt's too bad that we (B. and I) missed Jack and Joanne of Fork and Bottle because of our respective schedules. Our Californian friends spent some time in the Loire during their European trip and they will have many things and discoveries to write about I guess. But I am sure that they would also have loved to share this simple traditionnal country walk, even though the rosé wasn't up to the quality of the food. Back to the village : after having passed the local medieval castle and walked the full circle back to the stadium facility , everyone is offered (again!) 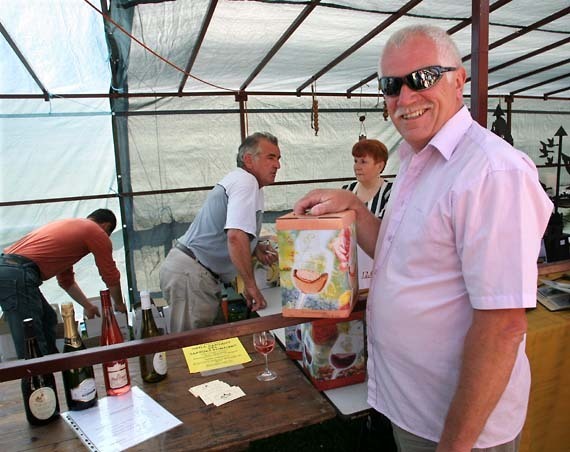 a "vin d'honneur" (a glass of wine) at about noon, and different prize cups are distributed, like to "the oldest person having made the walk, to the youngest, to the biggest village-group or family, to the person coming from the farthest city (could have been you, reader!). I already brought some Japanese friends and they got a prize cup ! 2 or 3 dozens of cups were awarded this weekend. Near the stadium, a vide-grenier (garage sale) is taking place the whole day (I made several bargains, including _believe it or not_ a lens-less SLR camera from the 70s' in perfect condition for 0,5 Euro : a Minolta SRT100X). B. needed another film camera as she lost recently her venerable Asahi Pentax, this will be my gift. The camera body was in a big cardboard box with a sign "every thing at 0,5 Euro". From this box, I also bought a mask and tuba and a portable tungsten light for photography from the 80s'. The UFOLEP doen't give a list for the walks in the main Loire "departements" like Loir et Cher (Prefecture : Blois) or Indre et Loire (Prefecture : Tours), but I could find the list for the Indre Departement (Prefecture : Chateauroux). Here are a few dates and locations (I'll add some more later). Bert - You've just shown us another reason for living in the Loire. Our short visit was wonderful. Sorry we missed you this trip. I checked the UFOLEP site but did not see an overall calendar for these events. Do you know how we can find out when and where they are scheduled so we can coordinate with a trip? 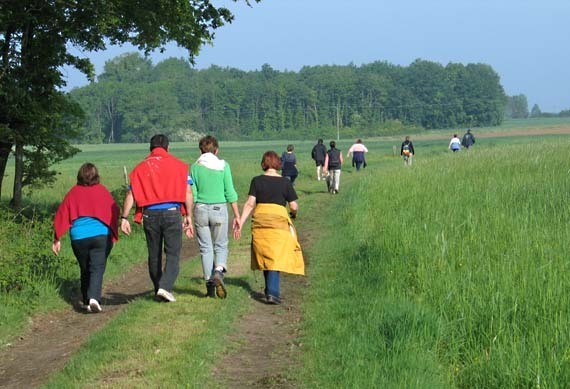 I'll post very soon a few dates and villages where such walks are organized in the Loire (by sunday evening).